I thought brown was more appropriate. 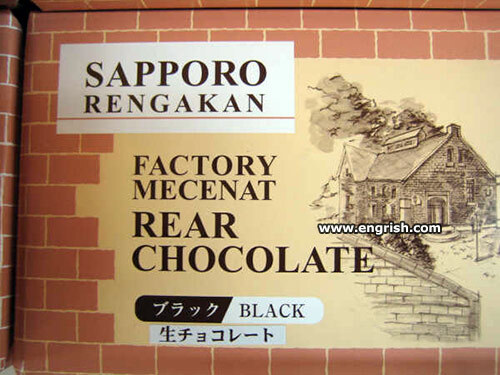 Not a chocolate I wish to try. Sounds like a bum deal to me. The Chocolate Starfish strikes again. Well. Most people reckon Carob tastes like s—. Factory situated on the Hershey Highway. @Marum | 7:58 am: Not if it’s done right. Problem is, most carob “chocolate” uses palm oil instead of cocoa butter. The bits of carob pods sold in packets are pretty good IMO; chewy, though, not chocolate consistency. At first I was confused whether they meant “rare” or “real”. Then I read the Japanese at the bottom left. Which reads “100% Raw Chocolate”. When diarrhoea breeds diarrhoea . . .